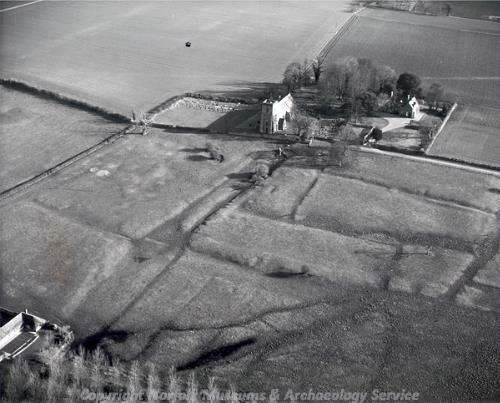 In 1970 the site of a deserted medieval village was discovered to the south of the church. Investigation of the site in 1974 and 1983 showed very fine earthworks relating to building platforms, enclosures, tofts and a hollow way that ran east to west between the church and Colts Hall. These earthworks were clearly noted on various aerial photographs of the area, including some taken as recently as 1994. The earthworks were fortunately underneath untouched pastureland and survived in good condition, and since 2001 they have been subject to an agreement to ensure their continued survival. 1970. Field 352 south of church. 11th -13th/14th century sherds including green-glazed and fragment of glazed tile found in scatter after ploughing. Very fine earthworks including hollow way running east-west from church to Colts Hall continue site around to west of church. Note plan in (S1) is over-simplified. 1 July 1976. Ordnance Survey aerial photography. D. Voisey (NLA) 20 February 1995. Further earthworks revealed to northwest as far as former Hall Grounds on Unit aerial photography. North earthworks found in 1979 comprise large ?house platform, deep depressions on north and east as shown on 1:2500 Ordnance Survey, but also on south not on OS, and central dividing arm very faint. Threatened by development - recommended for scheduling. However fieldwork plan given by source  to A. Gregory (NAU) 1986 shows at the house platform in northwest corner mentioned the site of the excavated post medieval house site with post medieval pits formerly located by source  further north, first at 4255/context 5 and afterwards at 4255/context 13 which he insisted was correct at the time. Which is correct? No sign of excavation noted here by A. Rogerson (NAU). E. Rose (NAU) 5 February 1987. 22 July 1993. NLA aerial photography. M. Brennand (NLA) 7 February 2001. 28 April 1994. NLA Air photography. Earthworks showing very clearly on photos. The main rectangular enclosures (aligned north-south) are particularly well defined as are the east-west holloway and boundaries. The ridge and furrow to the southeast is not discernable. The tofts to the northwest are just included at the edge of the prints. Post Medieval house to the west also visible. S. Massey (NLA) 6 February 2001. Earthworks still in good condition under untouched pasture. No earthworks in small poplar wood immediately to west. Owner died recently. Probate under way  a beneficiary. Any change of ownership will be notified to Helen Paterson (NLA). Earthworks under good grass cover with no disturbance. H. Paterson (NLA) 6 December 1995. 1st edition 25in Ordnance Survey 1883 shows a pound in southwest corner of field. E. Rose (NLA) 25 January 1996. This seems to have entirely disappeared (seen from car in passing). E. Rose (NLA) 15 February 1996. Earthwork survey at 1:1000 and report in file. Pottery identified by A. Rogerson (NLA). B. Cushion (NLA) March 1996. Plan and photo in file. Site in good condition, occassionally grazed by cattle and/or cut for hay. Some areas of 'hollows' colonised by nettles/thistles where cutting by machine is impossible. Possible Section 17 grant to be offered to owner . H. Paterson (NLA) 18 October 2001. Section 17 Management Agreement signed 16 November 2001. H. Paterson (NLA) 30 November 2001. J. Allen (NLA) 6 June 2002. Site extremely wet, especially at bottom on sloping field to west. Good grass cover. Grazed by cattle in summer months, nettles and thistles cut. A little poaching under two mature trees southeast of church. One rabbit hole under thorn northwest of church. H. Paterson (A&E) 28 January 2003. Good grass cover with a few thistle/nettle patches. Poaching limited to a small area of slippage on bank, and under two mature trees and scrub W of church. Summer grazing will continue, with nettles/thistles being 'topped' in the autumn. H. Paterson (A&E) 24 June 2004. Renewed Section 17 management agreement signed; backdated to November 2006. It covers the majority, but not all, of the Scheduled Monument. D. Robertson (NLA) 16 April 2007. Renewed Section 17 management agreement signed. D. Robertson (NLA) 28 January 2014. --- Aerial Photograph: TF6809 A,D; TF6709 F,R-S; TF6800 E-T; TF6808 V-AC. --- Aerial Photograph: OS 76-125-539. --- Aerial Photograph: OS 76-125-540. --- Aerial Photograph: TF 67 08 Z-AA. --- Aerial Photograph: Edwards, D.A. (NLA). 1993. TF 6808AD, AE. --- Monograph: Cushion, B. and Davison, A.. 2003. Earthworks of Norfolk.. East Anglian Archaeology. Vol 104. p 69. --- Archive: Ordnance Survey Staff. 1933-1979?. Ordnance Survey Record Cards. TF 60 NE 4. --- Article in serial: Gurney, D. and Penn, K. (eds). 1997. Excavations and Surveys in Norfolk 1996. Norfolk Archaeology. Vol XLII Pt IV pp 547-564. pp 558-559. --- Archive: Clarke, R. R. and NCM Staff. 1933-1973. Norwich Castle Museum Record Card - Medieval. Shouldham. <S1> Article in monograph: Smallwood, J. 1978. A Medieval Tile Kiln at Abbey Farm, Shouldham. East Anglian Archaeology. No 8, pp 45-54. <S2> Unpublished document: Norfolk County Council. 2007. Section 17 Management Agreement. <S3> Unpublished document: Norfolk County Council. 2013-2014. Norfolk Monuments Management Project Section 17 agreement.